The tranquil solitude of Sanibel Island awaits you in your own vacation condominium on the "Quiet Side of the Island". 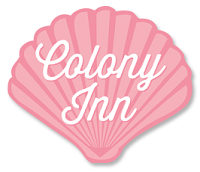 Colony Inn (formerly known as Colony Resort) is just steps from the water's edge. Stroll along the miles of white sand beach strewn with the exotic seashells that have made Sanibel famous. Bike along more than 26 miles of bicycle paths. Admire the abundant wildlife at the world famous J.N. Ding Darling National refuge. Each unit of the Colony Inn on beautiful Sanibel Island is individually owned, therefore each has its own unique look in terms of style and decor. The Colony Inn is conveniently located on the quiet, east side of the island one block from the shops and restaurants near the Historic Sanibel Lighthouse. We offer a heated, fresh water pool with a sun deck, coin-operated laundry, on-site bike rentals, free local, long distance and WiFi, and direct access to the beach (about a three minute walk). The friendly staff and well-kept grounds will make your stay comfortable and enjoyable. Come see for yourself all the Colony Inn has to offer for the perfect Sanibel vacation!